For his first 12 years Joel Magarey believed he was Jesus, 'the Son of the Most High'. Even when reality bit with the onset of puberty, he retained his immortal longing, and it is the intensity of his experience that lends this sometimes boyish tale of growth, journeying, love and obsession a depth and seriousness that lifts it out of any conventional travel genre. Often, during summer dusks as I sat on the pillar ... following the slow rise of an orange moon, I'd hear the sound of a note playing on the air ... Sometimes that haunting sound, the embrace of the warm wind, and the dark passion of the raging waves would gradually invade me until my thoughts had faded away, and in that darkness I would feel the presence of a force or power, a living presence it felt like — yes, it was the living presence of the universe, humming through the wind and the waves and the ocean and the island and all things. That feeling, a pressing, often painful awareness of the sacredness of the natural world and of the human lives lived in accordance with its imperatives, is the dominant tone of Magarey's storytelling. But it's a tone interrupted, distorted and sometimes drowned out by the compulsions that drive a young man as he travels in order to feed or escape his capricious demons. Exposure is part memoir, part travelogue, and part apologia: a hybrid 'tracking across the hurtling world' narrative that traces Magarey's many youthful journeys, physical and psychological. There is more than a touch of the Tom Jones in his sexual meanderings, and a bathetic absurdity in his ambition to sample a multicultural smorgasbord. What he enjoys in Ecuador — if that is the word for such highly-strung and Catholic-guilt-infused sexual dabblings — you won't find in the Lonely Planet Guide. It is also the diary of a young man suffering from a form of obsessive-compulsive disorder, which manifests in excruciating symptoms. There is his inability to make decisions (hence the weeks wasted in Los Angeles while he chases the impossible dream of the perfect, lofting down sleeping bag that will keep him alive while he sleeps rough — very rough and very cold — in Alaska); there is the recurrent, neurotic conviction that he has fathered a child with Mhely, a Filipina woman in Hong Kong, a child who just might inherit his own psychological afflictions — if he or she exists. More interesting, and more agonising, is his driven response to poverty and to suffering when he encounters it. In Bombay he goes on a crazed alms race, spending all his rupees on the streets, believing he can salve blindness. Only his travelling companion (in every sense), Penny, his long deflected love and the story's fulcrum, saves him by breathing her own deep sanity into his fevered frame. Penny, and the attenuated story of their on-again, off-again love affair, gives the book a gravitas that it needs to counterbalance the picaresque, sometimes grotesque adventuring of its hero/antihero. Penny seems to understand what impels her obsessive adventurer: she is his context, his compass, and in ways almost too deep to fathom, she is also the warrant for much of his manic seeking. Because Penny trusts him, so do we as readers — though not enough to embark on a trip down an Alaskan river in a canoe with him, or to go trekking in bear country or walking in a Scotland that he populates with importunate ghosts. If trust it is, it is of a different kind — to do with his understanding of what is meant by the humming of the wind and the waves. Magarey is a brave and driven — you could say foolhardy — traveller. And this is very exposed writing: revealing, rindless, self-critical, scarifying, for all its self-deprecating comedy. 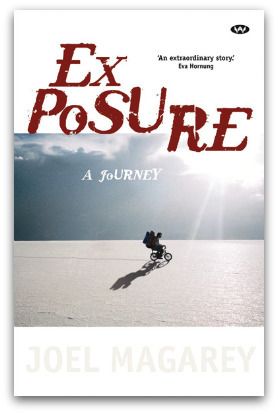 The title itself, Exposure, refers to the psychological technique the writer is supposed to employ in order to learn to live with his obsessions — by listening to them on tape, domesticating them almost. You want to wish him luck, but at the same time you don't want to see his Dostoevskian energy, his way of listening to the pulse of the universe dissipate, or grow less passionate, or committed. Wonderful review. A few questions regarding the book though. Why did the onset of puberty make a difference to the author's belief that he was Jesus? Does the book reveal why the author thought he was Jesus? What sort of Catholic school or family would bring up a child to hold such a belief? Surely it is intended as a joke by the author!? a sleeping bag would not be nearly as important as the military rifle with bayonet;(must have a bayonet); bears which are fast runners, swimmers and climbers, eat people; moose also kill people; then there are the wolves which hunt in packs. Canoeing down an Alaskan river: the rivers are large and fast, nothing like the Murray. Wild life, as above, are numerous. Joel Magery would need to be Jesus to survive. I agree, the author of the book does appear to have enjoyed quite an adventure! Lonely Planet meets extreme scouting/boy's own adventure holiday! The book sounds like it would make a good TV show. I look forward to reading it. Nevertheless, I still don't understand how anyone could in any good faith think they were Jesus. It must surely be a humorous statement in the autobiography, not meant to be taken seriously. A Catholic education does not present the case that anyone other than Christ himself is Jesus. Unless it is vanity, I can only think that it must be an aspect of the author's humour.